On August 31, 2011, I joined the R-DF21 and Subclades Project at Family Tree DNA with a kit I manage that represents my maternal grandfather’s Y-DNA, or direct male line. My grandfather’s favorite day was St. Patrick’s Day, and also the day that he died, just two days after his 80th birthday. He would be happy to know that as we approach his 103rd birthday, his Dolan DNA signature is being pushed back in time by an amazing group of administrators, researchers, and project members. When I was a little girl, he told me that his father went from Ireland to England to marry his mother. I know that he would love this work and he would be delighted to know that he is a descendant of the Seven Septs of Laois. Last night, R-DF21 and Subclades Project Administrator David R. Moore sent out the following memorandum. I am honored that he has given me his blessing to share it with the wider genealogical community. I am so excited to be a part of this project, led by a remarkable group of pioneers. The last 3 1/2 years as a DF21 project member have been an adventure and I’m looking forward to many more. My deepest gratitude goes to all who have contributed. I am anxiously awaiting the next update! To: R-DF21 Haplogroup Project; Groups B1, B4, B5 et.al. From time to time project members ask me about the current state of research on the Seven Septs of Laois and related L1403 clusters. As a result of the tsunami of new information from member Big Y tests and response from members testing newly discovered SNPs, we have expanded the Phylogenetic tree below L1403 and learned a good bit about our “deep ancestry”. But for an interested member of the project the information is hard to find, partly because we are using more that one testing company. Through a series of emails I will share with you what we now know, think we know, and hope to know. You’ve been included because you control a kit in the project or otherwise potentially have some interest in the research we are doing. If you do not want to receive these occasional emails, please let me know. Many thanks to those of you who did the Big Y test and to the others who ordered SNP tests. You make it all possible. Edwin Holcombe, administrator of the Morrison DNA project and I handle most of the research with assistance from others like Rory Cain and Gary Morrison. The work of a couple of giants in Y-DNA genealogy research, Alex Williamson and Mike Walsh, is relied on. The work includes interpreting test results, recruiting men to do additional test or joining the project, and meshing the results with ancient Irish (British Isles) history, etc. So, let’s get started and jump into the deep end. If all his does not click right away, don’t worry, it should eventually be clearer. First is a rough hand drawn sketch of the tree based on recent test results and showing the current state of the research. Then a written description by Edwin Holcombe of his time estimates, his description of the dispersal of L1403 descendants, our ancestors, and a few other points. The beginning of the L1403 SNP block is five SNPs more distant in time, or an additional (5 x 140=) 700 years. So the first L1403-block SNP is estimated to have occured about 2400 years before this point where the multiple SNP lines branched off as descendants of L1402. 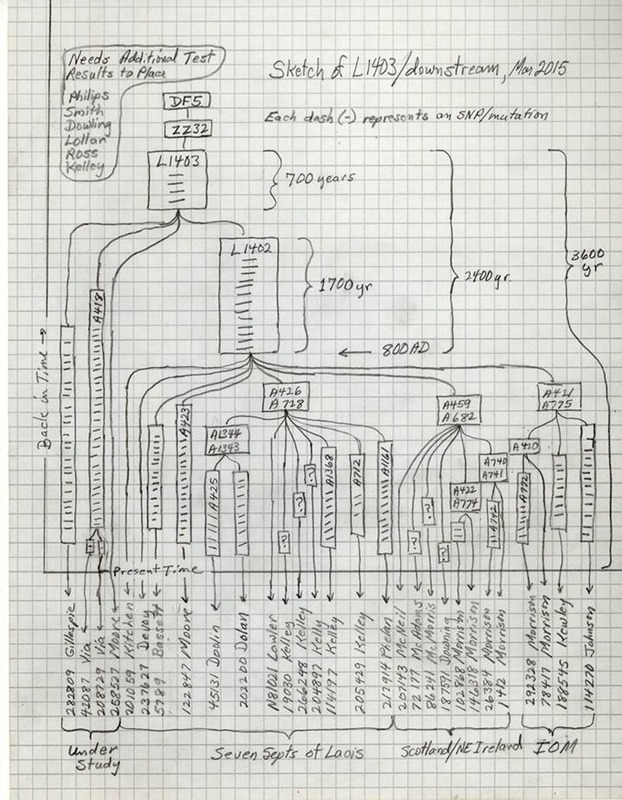 YFull.com has estimated the sister SNPs to L1403 to have occurred 3600 years before present on their SNP Tree. If we take that estimate as also applying to L1403 (not listed by YFull), then we would estimate the L1402 block to have ended 1200 years ago (3600 YBP – 2400 years= 1200 YBP), or 800 AD. Of course, this is only a rough estimate, but it does give us a period in time to which we should look for the “explosion point” to have occurred, the branching under L1402. With the SNP explosion occurring about 800 AD, it is safe to say that it occurred in Ireland. The O’Mordha clan of County Laois (later O’More, or Moore) began using their clan name as a surname in 1026 AD, but credible records show that they had been in County Laois at least since the 800’s. With many of the other descendants of L1402 later acquiring County Laois names as well, it is reasonable to think that these families lived in County Laois or its vicinity at the time of the SNP explosion. The use of surnames in Ireland began earlier than it did in other parts of the British Isles, apparently due in large part to the affinity the Irish had to their families (or clans). But is also seems that Irish surnames often changed after they were adopted as well, so that while the O’Mordha surname began being used as early as 1026 AD, there might be later branches of the same family who would begin to use a different surname to differentiate themselves as a distinct branch. For the next part of the discussion, you will probably find it helpful to refer to the following site where Edwin keeps up with the testing we do in his L1403 tree. Three lines of descendants of the L1402 SNP explosion (Moore; Devoy; and the A426 bunch – Doolin, Dolan, Lawler, Phelan, and the various Kelly) remained in County Laois long enough to acquire surnames that are still prominent there, but the other four lines (A459 Morrison, McNeil, McAdams, McMorris and Downing; A421 Morrison, Kewley and Johnson; Bassett; and Kitchen) seem to have migrated away fairly soon after the lines began, leaving no known representatives in their lines who were in Ireland long enough to establish an Irish surname branch of their individual SNP line. To be sure where they fit, Dowling, Philips, Smith, Ross, Rowan, and a Kelly of the DF21 project need further testing. The descendants of the L1402 block who moved away generally do not seem to have taken an Irish surname with them, which would support a migration between 800 AD and 1000 AD. However, it is possible that they left later and took surnames with them, but that the surnames were dropped when they arrived in new areas where surnames were not yet in use. It is interesting to look at how long after the SNP explosion we find new SNPs that are private, or near private, to only one particular surname. The A422 Morrison, A740 Morrison, A420 Morrison, and A1343 Doolin/Dolan SNP blocks each show a distance of three or four SNPs from the SNP explosion. At 140 years per SNP, this indicates consistent use of surnames began about 500 years ( 3.5 x 140 ) after the SNP explosion, or about 1300 AD. In fact, in much of Scotland and maybe on the Isle of Man, surnames were fixed about 1300 AD. In Ireland, as mentioned above, surnames were adopted earlier, about 1000 AD, but were subject to change as new branches of a family sought to distinguish themselves, and so they may not have been permanently fixed until about 1500 AD. This calculation based on fixed surnames supports the 800 AD date for the end of the L1402 block that was calculated from YFull’s estimate. Looking all the way back to the L1403 block, there are three branches: Moore/Via (Via is almost certainly NPE Moores); Gillespie; and the L1402 block and everything below that. The significance of the Moore surname being one of the branches or even the main L1403 branch and reaching this far back is not known. But it sure is interesting. The L1403+ L1402- Moores and the L1403+ L1402+ Moores have a Y-STR genetic distance of 18@67 markers, the same as the genetic distance between the L1402- Moores and Gillespie. Utilizing the method of estimating time periods discussed above, this would indicate that the 3 early branches form the L1403 block – L1402; Moore; and Gillespie – occurred perhaps around 900BC. So, how does this fit with the known surname lines under the L1402 block? —Moore: The O’Mordha line was established by the 9th Century and that surname adopted by 1026. There is no conflict with the L1402 Moore line beginning about 800 AD as a distinct branch of descendants of the L1402 block. —Two Morrison (Mac Giolla Muire) Lines: Based on surnames alone, it is reasonable to suspect that the A459 Morrisons and the A421 Morrisons are more closely related to each other than they are to the other branches lines downstream of the L1402 block. However, no SNP connecting A459 and A421 has been found. It is possible that such a SNP exists, but was not covered by Big Y (which covered only about half of the Y-chromosome). Another possibility is that a single Mac Giolla Muire branch of the family migrated before a new SNP had occurred in that branch and that A459 and A421 occurred one or more generations later. The question of why so many surnames other than Morrison show up under these SNPs also needs to be asked. (The Downing name might be discounted as an NPE, but that leaves McAdams, McNeill, Kewley, and Johnson.) As mentioned above, one answer might be that when these lines migrated between 800 AD and 1000 AD to areas that did not yet use surnames, their surname identity was sometimes lost. Further SNP and STR investigation may answer these questions. As a final step Edwin looked at the private SNPs for each of the L1402 Big Y tests. (Private SNPs are SNPs unique to one particular person or closely related group of persons.) After eliminating some questionable SNPs, multiplying the average number of private SNPs in each line by 140 years and counting back from the present, we estimate the major branch points under the L1402 block may be up to 200 years earlier than was calculated using the method of counting forward from 3600 BC. Well, that’s the first update. While most of the information is factual, it should be pointed out that time periods are estimates. And there are more than one method of making these kinds of estimates. This is one of them. Ancient Irish historical research is underway in an attempt to make the most sense of some of the facts we have.